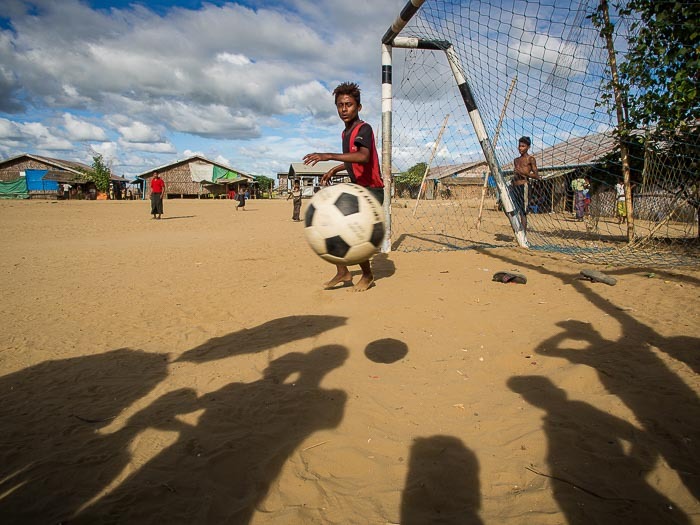 People watch soccer practice on a dirt pitch in a IDP Camp near Sittwe. My recently concluded trip to Myanmar was the first reportage work I've done without a digital SLR in more than a decade. Regular readers will know that I switched to Olympus gear and Micro 4:3 as my principal photographic tools a few weeks ago. This comes after years of using M4:3 to complement my Canon full frame bodies. Back in the days of film I used to travel with either my Leica M series exclusively or, towards the end of the film days, my Contax G cameras exclusively. I worked with the Leica and Contax cameras for the same reason I like the Olympus M4:3 - they're smaller, lighter, and less intimidating. I made the move to M4:3 because I wanted something lighter and easier to carry. The Micro 4:3 cameras are ⅓ the weight of the Canons. I have to admit, I was a little nervous about going on a trip like this with just the M4:3 cameras. Would I miss the responsiveness of the Canons? What about the high ISO performance? Or battery life? I am happy to report that the Olympus E-P5s exceeded my expectations in almost every way. There were no problems with autofocus, even when I photographed Ashura observances in the middle of the night (and it's very dark on the streets of Yangon). High ISO was better than I expected (although I limited myself to ISO1600). And battery life? Well battery life is what it is. Olympus estimates about 300 exposures from a fully charged battery, but that depends on things like use of flash, use of the LCD and how you use the camera. I must be pretty conservative in how I use my E-P5s because I averaged about 320-350 exposures per battery, which is still about ½ to ⅓ of what I can get out of a Canon battery. I carried six batteries and four chargers with me. During one of the days of photographing Ashura, I went through four batteries and ended up using all four chargers to get the batteries charged before the next day. Ashura observances in the middle of the night in Yangon. ISO1600, 1/15th of a second, f4, with a little pop of flash. I would like to have better battery life, but none of the mirrorless cameras offer the same battery life traditional dSLRs have. In fact, the only technical problem I had on the trip was Macintosh related. Power in Myanmar is unreliable (at best) and one afternoon while I was editing in Sittwe the power blinked off and on. The power adapter for my MacBook Pro (MBP) made a popping sound when the power went out and the computer shut down. A beggar on a railroad track at the entrance to the IDP camps. My E-P5 with the Olympus 75mm f1.8 lens (corresponds to a 150mm lens). At this point I wasn't sure if the computer was damaged or if the power supply was dead and I couldn't find another Macintosh power adapter to use for troubleshooting. I didn't use the computer again for the rest of the trip (because I had no way of charging the battery and I didn't want to run it down completely), which meant I ended up coming back to Bangkok with a lot of work to edit. When I got back to Bangkok, the first thing I did was plug the MBP into my work station at home and viola, everything was fine. Then I tried the power adapter I had taken to Myanmar with the backup MacBook Pro I keep in Bangkok and the power adapter didn't work. Whatever happened when the power blinked in Sittwe fried my adapter but not the laptop. I carry a lot of backups when I travel. Two camera bodies, four or more lenses. Twenty plus memory cards. The only redundancy I don't travel with is a backup computer. There's a limit to what I can practically carry, and the second MacBook Pro hits that limit. (Although when I was working in the US and traveling by car I did usually carry a second MBP.) I might very well start carrying a second power adapter though. Southeast Asia is hard on power adapters (this is the second one I've blown out in a year) and in hind sight carrying a spare seems like a good idea. 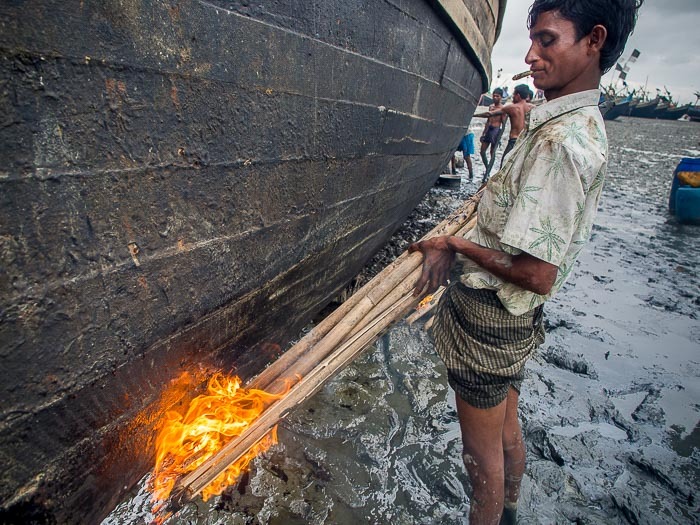 A worker in a Rohingya "shipyard" melts tar into the seams between planks to waterproof a Rohingya fishing boat. E-P5 with the 12mm lens (corresponds to a 24mm lens). 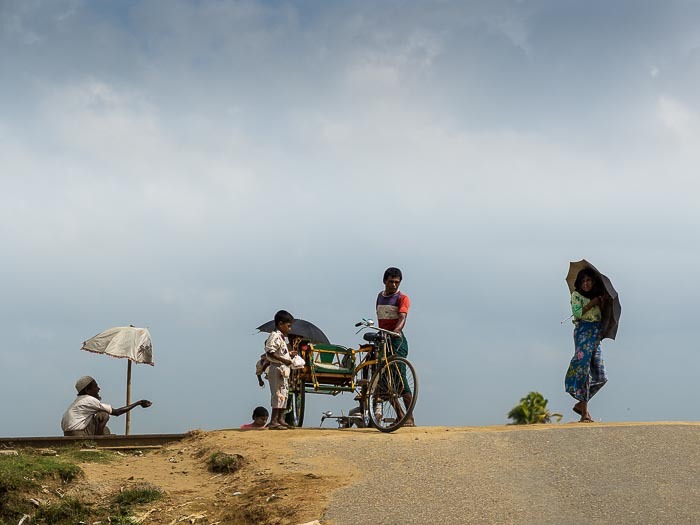 The Olympus cameras and lenses performed as well as I expected while I was in Myanmar and I carrying the much smaller load was a lot easier on my back.